Going through my late dad's stuff, I found a bunch of vintage cameras (including a Lumicon Silver 8, a Kodak Six-20 Brownie C, and a Kodak Brownie Reflex). 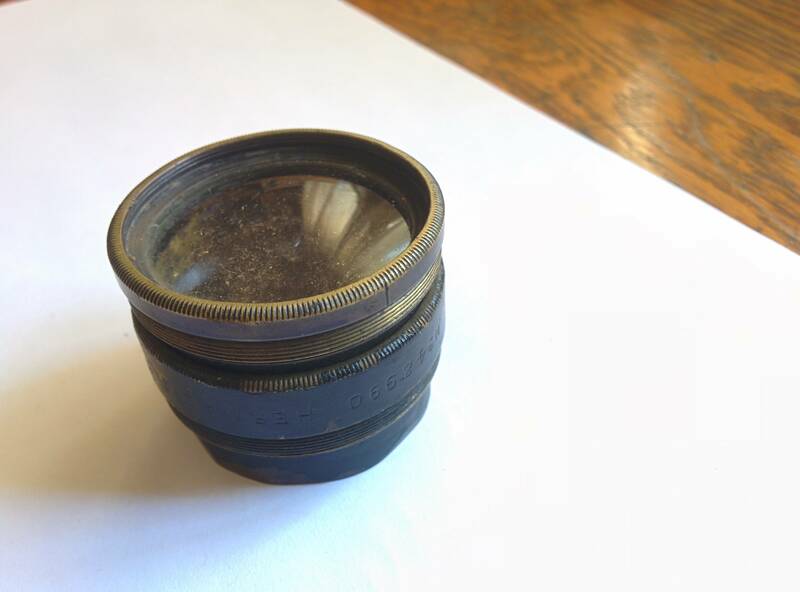 There is one piece of equipment I couldn't identify - it's a lens that looks very old, seems to be made of brass, and says "HERMAGIS OPTn BteS GDG PARIS OBJECTIF CINEMA". I remember using this as a kid as a "magnifying glass". 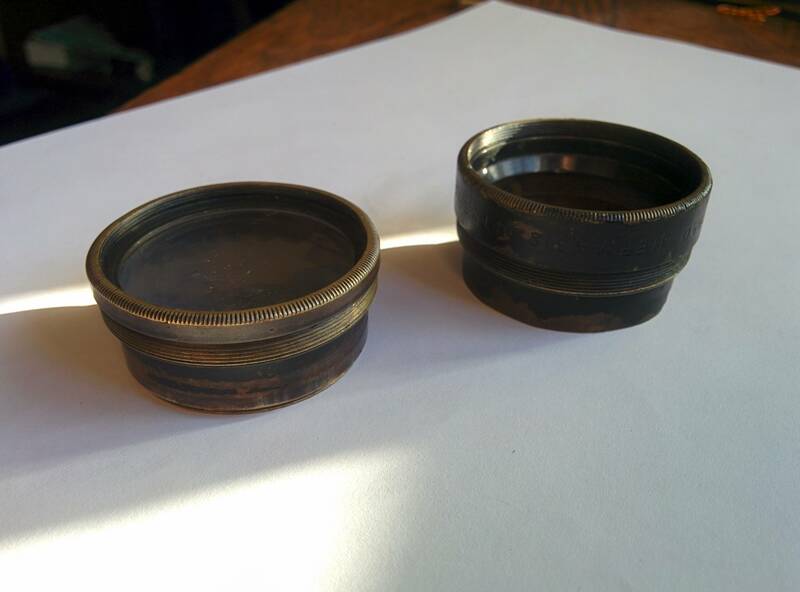 Now it clearly is a cinema camera lens, but since it doesn't have any other markings, I'm stuck. How can I find out what this is? 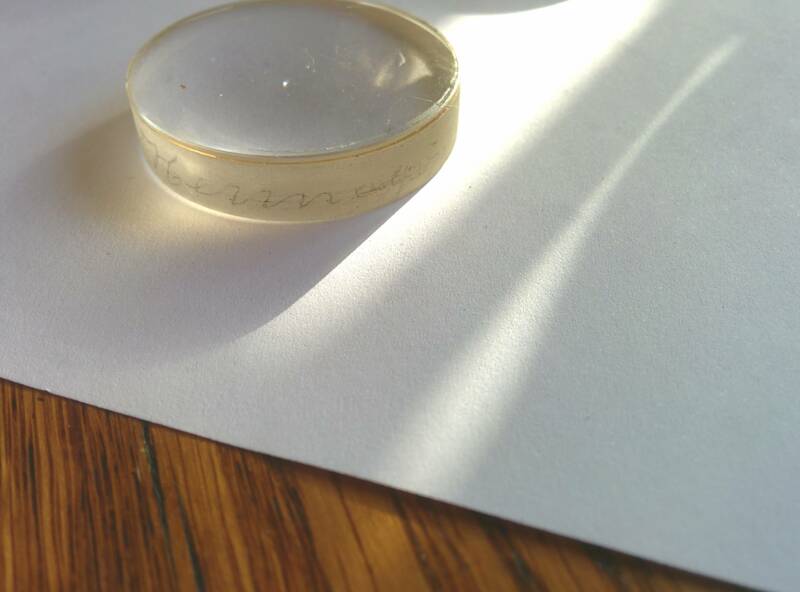 On closer inspection, the lens seems to have two outer threads - maybe this is two different things screwed together? Like a lens and (part of) the thing with the shutter? The french "objectif" throws me off a bit here (and this would be written in the non-lens part, if this is indeed two parts). May try to use some oil to unscrew it. For the moment I'm going to ignore the minor detail that this is a projection lens, and consider it purely as a lens. You can determine at least the basic characteristics fairly easily. First, let's consider the focal length. The focal length of a lens is the distance you have to hold the lens from a plane to get an object at infinite distance to focus on that plane. For experimental purposes, it's usually easiest to treat the distance from the earth to the sun as infinite. So, if you go outside on a sunny day, you can focus the sun on the ground. Then measure the distance from the lens to the ground when the sun is in focus, and that's the lens' focal length. At least that's the theory for a "thin lens", which is mostly a theoretical concept. With a real lens, you're supposed to measure from the "primary node" of the lens, which you probably don't know. For the sake of simplicity, I'd measure from approximately the front element (the one closest to the sun, in our scenario). Although it won't be perfect, that'll give at least a reasonable idea of the focal length. From there you can pretty easily compute the aperture. The aperture is measured as a ratio to the focal length. You measure the diameter of the hole the light can go through, and divide that into the focal length you measured earlier. For example, let's assume you measured the focal length as 10 cm, and the diameter as 2 cm. That would mean you have a 100 mm, f/5 lens. Hermagis OPTn (Opticien) was an optical manufacturer located in Paris during the second half of the 19th century or so. 'Bte S.G.D.G.' is an abbreviation of 'Breveté Sans Garantie Du Gouvernement', which means 'Patent without government guarantee'. S.G.D.G. was previously used as a disclaimer on patents issued by French authorities to signify that the patent does not guarantee any practical functionality of the relevant object. 'Objectif Cinéma' is French and means 'projection lens'. So, what you have simply seems to be a patented projection lens from Hermangis. Any reason why you doubt this? Not the answer you're looking for? Browse other questions tagged lens old-lenses vintage equipment-identification or ask your own question. Is it possible for a hobbyist to create a lens element? 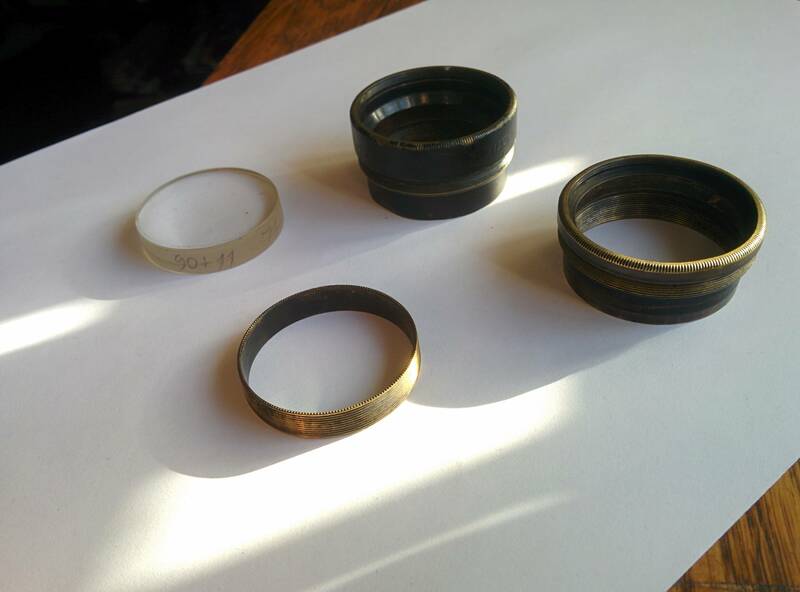 Can I fix a M42 50mm lens myself? What is this large white Canon telephoto lens in a 1990 magazine ad for the EOS 1? 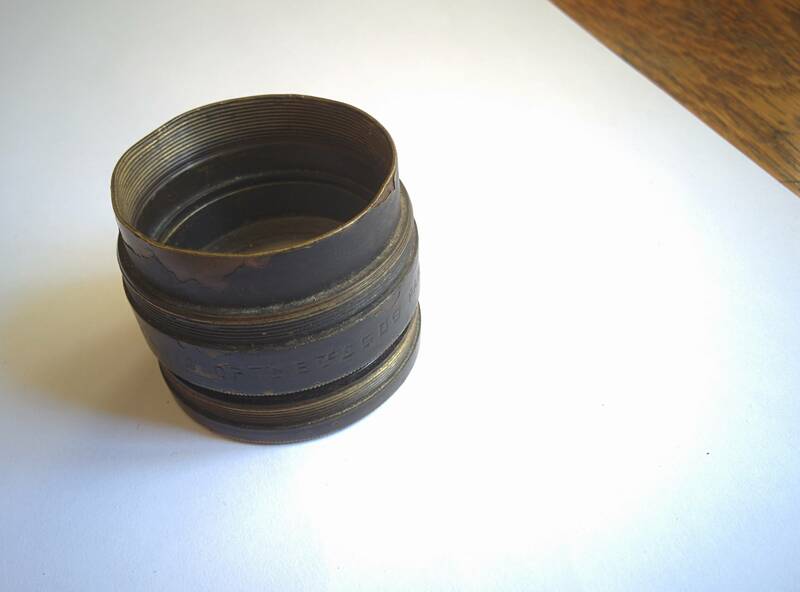 What is this Angenieux lens? Is there a way to remove fungus without dismantling the lens?